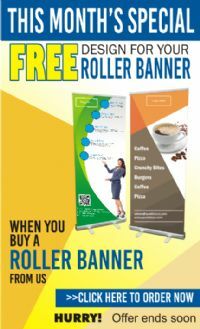 Our Roller banner are printed digitally on a wide format press and comes with brushed aluminium stands with swing out feet and a pre-fitted graphic and carry case. For limited time we are also offering FREE DESIGN SERVICE. 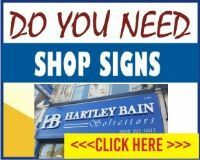 Do you want our designers to create artwork for your Roller Banner? If you have a clear idea of what you are looking for please provide as much description as you can as this will help them get as close to what you are looking for. The more you are able to tell us the more likely we will produce a design you are happy with the first time. For inspiration and ideas, we can email you a few templates, if you request us to do so during the ordering process. Then all you have to do is to email us back the template reference number and our designer will do the rest. Please also note that your job will not be sent in printing until you approve your artwork and once you approve your artwork, your job turnaround time will be started. Please note, it is important to give us all the information you can at this point as after an initial proof it could cost you extra for a redesign. Please prepare your artwork within this size and do not leave any extra blank space which normally rolls into the cassette. We would do that for you before printing.